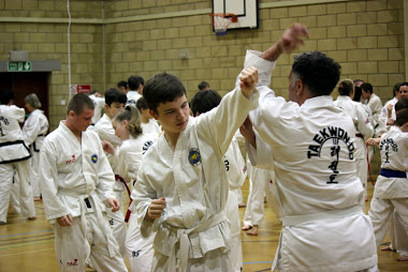 Taekwon-Do (TKD) is a dynamic Korean martial art that combines hand and foot techniques and provides the practitioner with an effective method of self defence. Training provides a total body workout which will improve cardiovascular fitness, strength and flexibility. Swift Fox TKD teaches a traditional ITF syllabus and as such, training is built around the five tenets: Courtesy, Integrity, Perseverance, Self-Control and Indomitable Spirit. So whether you are looking to get fit, learn self defence, improve self confidence or are just looking for a fun, new social activity, we would love you to join us.